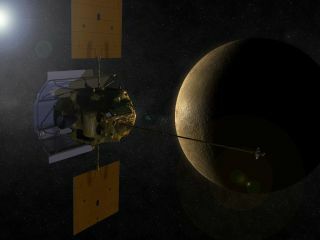 NASA's Messenger probe promises to show us a whole new Mercury when it arrives in orbit around the planet next week. The spacecraft has been flying almost seven years, but just now will it achieve its primary mission – an up-close and personal study of the closest planet to the sun from orbit. Dr. Sean C. Solomon standing before the MESSENGER spacecraft just prior to its journey from Goddard Space Flight Center to Kennedy Space Center, March 9, 2004. SPACE.com: What's your mood approaching this milestone? Sean Solomon: We cannot wait for orbital insertion. We've, of course, been devoting an enormous amount of time to the orbital insertion event. To testing everything, to contingencies, to analysis, to practice. We've had our mission operations team practice with an independent team throwing in anomalies. The team didn't know what they were going to get – they've been going through their paces. SPACE.com: If you had to pick one question that you hope Messenger answers when it enters orbit around Mercury, what would it be? Solomon: That's an unfair question! That's a "Sophie's Choice" question. I have now been with this mission for 15 years, and these are my children. These questions are my children and these instruments. I come out of geophysics, and so I got interested in the origin of the great faults, the amount of shrinkage of the planet, the origin of the magnetic field, the whole question of how Mercury ended up with such a large core as a fraction of its mass – twice as large a fraction as Earth or Venus or Mars. These are large-scale structural and evolutionary questions that I first got interested in right after Mariner 10. But I'm now fascinated by the magnetosphere and the exosphere, charged particles, and so I can't give away any of those. SPACE.com: How much of what Messenger has already revealed has been surprising? Solomon: A lot of the aspects of the volcanism story were surprising. And the degree to which the magnetosphere and exosphere change – small changes in solar and interplanetary conditions – was a surprise. And so we're very much looking forward to watching those evolve in real-time from orbit, and to do so at a time when solar activity is ramping up. The interaction between the magnetosphere and the exosphere are more extreme than we expected. So it's great fun. SPACE.com: So what if humans had a really great spacesuit and they could visit the surface of Mercury. What would it be like? Solomon: It would need to be a really great spacesuit. It would be a pretty stark landscape. The sky would be black. You wouldn't see the exosphere, you wouldn't smell the exosphere. You'd be walking around on a landscape with many impact craters, with huge cliffs. The sun would be as much as 11 times brighter than on the Earth. So in terms of the dimension on the sky it'd be more than three times as big. You would be subjected to charged particles of high energy, other kinds of radiation, so that's why you'd need that great spacesuit. You might be able to dive into some permanently shadowed craters, and find, within a meter or two of the surface, water ice, if that's the right explanation. So it would be a very different kind of place. A somewhat lunar-like landscape with more topography. And you would just be conscious in the day side of how close you were to the sun.